A two piece set comprising Geometric 3-4-4a and 3-4-4b. I wanted to bead a set which illustrated that the placement of colour on a piece could change the total look and apparent scale. Both pieces use the same colours, the same number of rows and beads and are identical apart from the reversal of the colour placing. 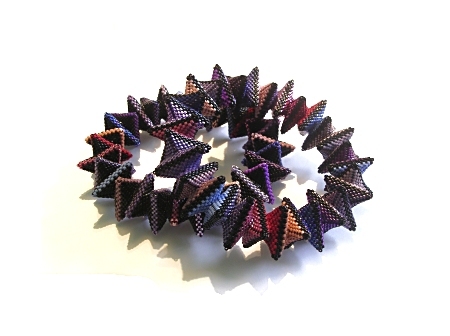 Update June 2008- Geometric 3.4.4 won 1st place in the bracelet category of the 2008 Bead Art Awards.